This article is written to assist veteran service organizations to pursue higher rating for the veterans they assist. I know that the material is highly technical and may not be suitable for the general public. I tried to provide the representatives however, with an introduction to the anatomy and the common pathology seen in knee injuries and chart a pathway to obtain higher rating for knee injuries. I argue that the representative shall object to the practice. Currently used by the VA of simple measurement of flexion and extension limitation. The representative should insist that the limitation include full evaluation of stability, the use of braces, crutches and canes, the effect of pain, endurance , gait disturbance, and the combined effect of all those limitations on veterans ability to work and his daily activities. as can be readily appreciated by reviewing the rating table enclosed, one can clearly see that for the common knee injuries presented the maximal rating is 30%. I shall ignore the rating for knee, ankylosis. Because the condition is extremely rare for veterans due to advances in knee surgery. 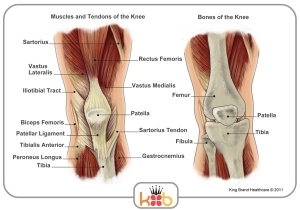 Ankylosis means that the knee is fixed and flexion and extension of the knee is at best incomplete. We should contrast , the rating for knee injuries with the rating for knee replacement. It is ironic that actually after the veteran undergoes successful knee replacement with reduced pain instability and easier ambulation, the veteran is considered more disabled than he was before he underwent such surgery. The only reason for the difference between the rating of this group of patients is that rating for artificial knee is rather new. While the rating for knee injury was created before World War II. Note (1): A full arc of motion of the knee after arthroplasty is a range of motion of 0 to 110 degrees. 38 C.F.R. § 4.10. holds that the basis of disability evaluation is the ability of the body, system or organ of the body to function under the ordinary conditions of daily life including employment. 38 C.F.R. § 4.40. holds that Disability of the musculoskeletal system is primarily the inability to perform the normal working movements of the body with normal excursion, strength, speed, coordination and endurance. Functional loss may be due to the absence or deformity of structures or other pathology, but it may also be due to pain, supported by adequate pathology and evidenced by the visible behavior in undertaking the motion. Weakness is as important as limitation of motion, and a part that becomes painful on use must be regarded as seriously disabled. With respect to joints, inquiry must be directed to weakened movement, excess fatigability, incoordination, pain on movement, swelling, deformity or atrophy of disuse. The Board also must consider a Veteran’s pain, swelling, weakness, and excess fatigability when determining the appropriate rating for a disability using the limitation of motion diagnostic codes. 38 C.F.R. §§ 4.40, 4.45; see DeLuca v. Brown, 8 Vet. App. 202 (1995). Additionally, VA General Counsel opinions provide for separate evaluations for knee instability and knee arthritis in certain cases. See 38 C.F.R. § 4.71a, Diagnostic Codes 5003, 5010, 5260, 5261, 5257 (2012); see also VAOPGCPREC 23-97; 62 Fed. Reg. 63604 (1997) (knee arthritis and instability may be rated separately under Diagnostic Codes 5003 and 5257, provided that any separate rating is based upon additional disability); VAOPGCPREC 9-98; 63 Fed. Reg. 56704 (1998) (if a disability rating under Diagnostic Code 5257 for instability of the knee is in effect, and there is X-ray evidence of arthritis, a separate rating for arthritis based on painful motion can be assigned under 38 C.F.R. § 4.59). In Mitchell v. Shinseki [No. 09-2169 8/2011] the United States Court of Appeals for Veteran Claims (CAVC) held that remand is warranted where the examiner did not reconcile a veteran’s complaints of pain and fatigue with the examination that found minimal loss of movement on passive flexion and extension. § 4.59 Evaluation of pain in musculoskeletal conditions. 11.3 How is functional assessment of joints conducted? Because the CAVC found that the traditional VA method of assessing disabilities for rating purposes – one-time measurement of active and passive ROM – was inadequate under VA regulations, as functional impairment may be underestimated, additional factors must be considered for each joint examined. See Deluca v. Brown, 6 Vet. App. 321, 324 (1993). 4) effects of episodic exacerbations (flare-ups) on functional ability. b. Each of these issues should be assessed and the amount the joint is additionally limited (if any) resulting from one or more of these factors should – if possible –be reported in degrees of additional loss of motion. The absence of any (or all) of these factors should also be noted. You must be specific as to where (i.e., from flexion or extension) any additional losses should be subtracted. For example, if knee pain on ROM testing prevents full flexion and an additional ROM loss for pain of 20 degrees is warranted, you must specifically state the additional limitation of flexion due to pain (e.g., “An additional 20 degrees loss of knee flexion is warranted because of pain on movement” or, better and clearer, “Because of pain on movement, the ROM is estimated to be 0 to X rather than 0 to Y found on range of motion without taking pain into consideration.”). At present there are no guidelines as to which tests should be used to determine the strength and endurance for the various joints. These tests should be individualized, keeping in mind patient safety. c. Describe the patient’s functional disability as to effects on daily activities (eating, dressing, walking, breathing, etc.) and employment. The law provides that a vet is entitled to a separate disability evaluation when an injury manifests in 2 different disabilities. the rule provides that evaluation of the same disability (or manifestation of disability) under various/different diagnoses is to be avoided. As long as the symptoms do not overlap or are duplicative, then the rule against pyramiding set forth in section 4.14 isn’t violated. clarifies the application of this law in Esteban. Veteran was injured on right side of face in motor vehicle accident in January 1949 in Okinawa. and pain on right side of face. The BVA denied his claim for injury to his facial muscles and pain to his face and limited his benefits to the scars and assigned a 10% rating under DC 7800 for moderately disfiguring scars. The court rejected the BVA analysis. It held that the summary conditions may be rated separately unless they constitute the “same disability” or the “same manifestation” under 38 C.F.R. § 4.14. The support for establishing, three separate disabilities is that “None of the symptomatology for any of the 3 conditions is duplicative of or overlapping with symptomatology of the other 2 conditions”. • (3) facial damage resulting in problems with mastication (chewing). and a third 10% rating for facial muscle injury interfering with mastication under DC 5325.
it held that Limitation of Motion and instability may be rated separately under DCs 5003, 5260, or 5261 for limitation of motion and DC 5257 for instability. A separate rating for arthritis could also be based on X-ray findings and painful motion under 38 C.F.R. § 4.59, per Lichtenfels v. Derwinski, 1 Vet.App. 484 (1991). held that Painful motion even without x-ray findings of arthritis may also warrant a separate compensable rating under 38 C.F.R. § 4.59.
provides for Separate ratings under DC 5260 (leg, limitation of flexion) and DC 5261 (leg, limitation of extension), may be assigned for disability of the same joint. mysteriously, despite any objection to the proposed rules, the new rating code were not incorporated in the rating guidelines, I argue, however, that to these new rule are binding on the veteran administration. In Gerard Cullen, , v. Eric K. Shinseki,. “Turning to VA’s notice of proposed rulemaking, published in the Federal Register in September 2002 (prior to the final rule’s enactment in November 2003….The Court concludes that VA’s position is consistent both with the regulation itself and with VA’s demonstrated interpretation of the regulation and is therefore due substantial deference from the Court. See Auer, 519 U.S. at 461-62; Cathedral Candle Co., 400 F.3d at 1364”. Diagnostic code 5258 is currently titled ‘‘Cartilage, semilunar, dislocated, with frequent episodes of ‘locking,’ pain, and effusion into the joint’’. It provides a single evaluation level of 20 percent. The VA proposes to provide a 20-percent evaluation for meniscus injury with episodes of giving way, locking, or joint effusion that interfere at times with activities of daily living and prevent activities such as running and jumping, and a 10-percent evaluation for meniscus injury with episodes of giving way, locking, or joint effusion that do not interfere with activities of daily living, but that at times interfere with activities such as running and jumping. The VA also proposes that evaluation alternatively be based on instability, degenerative arthritis, etc., depending on the specific findings, under the appropriate diagnostic code, because these are possible effects of meniscus injury or surgery. The VA also proposes to add a note directing that an evaluation under diagnostic code 5258 be combined with an evaluation for pain (under § 4.59) when appropriate.. Diagnostic codes 5260 and 5261 currently pertain to limitation of flexion of the leg and limitation of extension of the leg, respectively. Because the terms extension and flexion are functions of the knee joint. Flexion of the knee limited to 15 degrees is currently evaluated at 30 percent, flexion limited to 30 degrees is evaluated at 20 percent, flexion limited to 45 degrees is evaluated at 10 percent, and flexion limited to 60 degrees is evaluated at zero percent. Based on the VHA Orthopedic Committee the VA proposes to provide a 30-percent evaluation if flexion is limited to 30 degrees, a 20- percent evaluation if it is limited to 60 degrees, and a 10-percent evaluation if it is limited to 90 degrees. Under diagnostic code 5261, currently ‘‘Leg, limitation of extension current evaluations are 50 percent if extension is limited to 45 degrees, 40 percent if it is limited to 30 degrees, 30 percent if it is limited to 20 degrees, 20 percent if it is limited to 15 degrees, 10 percent if it is limited to 10 degrees, and zero percent if it is limited to 5 degrees. The VA proposes to provide evaluation levels of 50 percent if extension is limited to more than minus 30 degrees (lacks more than 30 degrees of full extension), 30 percent if extension is limited to between minus16 and 30 degrees (lacks 16 to 30 degrees of full extension), and 10 percent if extension is limited to between minus 5 and 15 degrees (lacks 5 to 15 degrees of full extension).